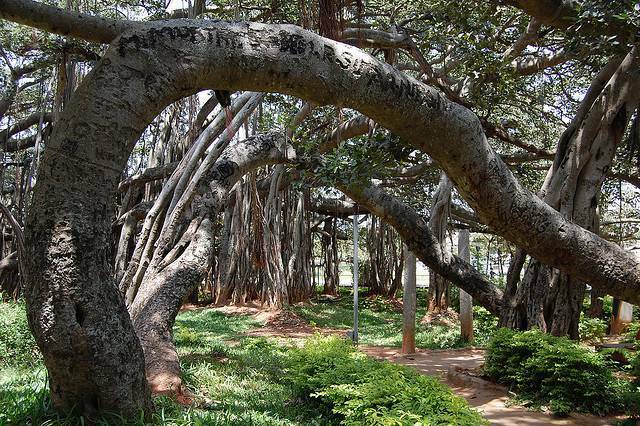 The famous Big Banyan Tree or Ficus Benghalensis, which is also known as Dodda Alada Mara in Kannada language, is located at Ramohalli, close to kengeri and just about 28 kilometers west of the city of Bangalore. The tree is that it is over 400 years old and covers an area of almost 3 acres. The whole tree is fenced and one can walk alongside the labyrinth of roots, which make a cool, shady location. The Savanadurga monolithic hill and the backwaters of the Manchanabele reservoir form a serene backdrop to its spreading branches and make for a good picnic spot. Monkeys roam around the place abundantly. The tree is one of the largest of its type and is thought to be symbolic of the trinity with the roots representing Lord Brahma, the stems/bark representing Lord Vishnu and the branches representing Lord Shiva. The tree has been put under the care of the horticultural department and since then, steps to nurture the tree and protect and conserve its roots have been rigorously taken. Ramohalli is a quick getaway from the Bangalore City and can be covered as a day trip. Manchinbele dam is quite near this place so do visit it if you have time.